As a first-time author and publisher, I was somewhat uncertain of how the review might turn out but I did agree to submit my book for his review. I was pleasantly surprised at Scott Allen’s review. 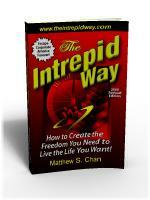 He gave “The Intrepid Way” a rating of 4-stars out of 5. ForeWord Clarion Gives “The Intrepid Way” a 4-Star Review!